Having certain medical conditions can affect your oral health. Learn more about how pregnancy, diabetes, cancer treatment, and eating disorders can affect oral health and what you can do to keep good oral care. Are you expecting? Good oral health is important during pregnancy. In fact, research has shown that there is a link between oral disease and pregnant women giving birth prematurely or to low-birth-weight babies. Taking care of your mouth is important for the overall health of you and your baby. But many women may not understand how pregnancy can affect oral health or what they have to do to maintain good oral care. Pregnancy causes changes in your body in many ways - and your mouth is no exception. Hormone changes during pregnancy can affect oral health. You may experience oral problems that you didn't have before pregnancy. Pregnant women are at increased risk of cavities, gingivitis, and sensitive gums (such as bleeding when you brush). Pregnancy gingivitis. Hormone levels during pregnancy cause gum tissue to be more sensitive to plaque. If the plaque isn't removed, gingivitis (red, swollen, inflamed gums that are more likely to bleed) occurs. Pregnancy gingivitis is actually not different from gingivitis that occurs in people who aren't pregnant, but because gingivitis often occurs in pregnant women (especially between months two to eight of the pregnancy), it's called "pregnancy gingivitis." Pregnancy tumors. This term sounds scary but these tumours are not cancerous. They are growths of gum tissue that appear in the mouth during the second trimester. They usually go away after the baby is born. However, your dentist may remove the tumors if they bleed, prevent you from eating properly or doing proper oral hygiene, or do not go away after the baby is born. Gingival enlargement. This is an increase in size of the gums and occurs less frequently than pregnancy gingivitis and pregnancy tumors. The gums may enlarge to the point that they cover the teeth completely. Enamel erosion. Pregnant women have increased acid in the mouth because of morning sickness. The acid causes dental erosion. metal fillings for cavities. Your dentist can recommend other types of fillings if needed. routine dental x-rays. Sometimes, dental emergencies require the use of x-rays to help diagnose the problem. If this is the case, your dentist will take all precautions to protect you and your baby (e.g., using a lead apron placed on your abdomen to shield the radiation from you and your baby). Talk to your dentist if you have any concerns. What can I do to maintain good oral health during pregnancy? Make an appointment with your dentist as soon as you are pregnant or if you are planning to become pregnant. Go for a dental check-up during your first trimester and get a cleaning done. Visit the dentist regularly while pregnant. For most people, this may mean every 6 months, but for others, your dentist may have recommended you to visit more or less often (e.g., once during the first trimester and once during the second trimester). Follow the schedule your dentist suggested. Brush your teeth at least twice a day with a fluoride toothpaste. If you can, also brush after each meal. Floss daily as well. Keeping your teeth clean, especially near the gum line, will help prevent gingivitis. For some women, brushing causes morning sickness. If that's the case, rinse your mouth with water and use a rinse with antibacterial properties or fluoride. Snack wisely. Pregnancy can bring on cravings for certain foods and for eating more than usual. Try to avoid snacks with high sugar content. Rather, choose nutritious snacks such as fruits and vegetables. After snacking, brush your teeth. People with diabetes are more at risk of oral disease than people without diabetes. If you have diabetes, it's important to maintain good oral care to reduce your risk of mouth problems such as gingivitis. Common oral health problems in people with diabetes include cavities, gum disease, fungal infections, and taste impairment. Diabetes lowers the body's resistance to infection and can slow wound healing. People with diabetes may also produce less saliva, which can cause dry mouth and a burning sensation in the mouth. Since saliva helps protect the teeth from cavities, having less saliva can lead to cavities. are more at risk of oral diseases (e.g., oral infection, gum disease) than people who do not have diabetes. Unfortunately, having gum disease can then make it harder to manage blood sugar. 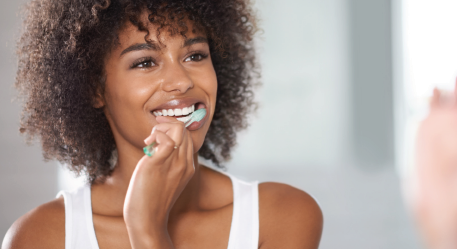 What can I do to maintain good oral health? Keep your blood sugar levels under control. Take your medications as prescribed by your doctor and monitor your blood sugar levels regularly. Other ways to keep your blood sugar levels under control include eating a healthy diet, exercising regularly, and maintaining a healthy weight. Maintaining good blood sugar levels may help to reduce your risk of oral health problems. Help prevent plaque formation and acid attacking your teeth: Brush your teeth at least twice a day with a fluoride toothpaste. If you can, also brush after each meal. You should also floss daily. Get regular check-ups from your dentist (and let your dentist know you have diabetes!). For people with diabetes, dentists may recommended dental visits every 3 months. Follow the schedule your dentist suggests. At the appointment, let your dentist know of any changes in your health status and any symptoms you may have (e.g., sores, mouth pain, swelling, or areas of redness in the mouth). Get treatment for oral infections immediately. Cancer treatment can affect your oral health, even if you are not being treated specifically for the mouth. Radiation therapy to the neck and head area and chemotherapy help treat cancer, but they can also cause side effects affecting the mouth. Many people undergoing cancer treatment don't realize that a dental check-up is important in maintaining your overall health. How does cancer treatment affect oral health? What can I do to maintain good oral health during cancer treatment? If possible, visit your dentist 1 month before you start cancer treatment. Mouth problems from cancer treatment may occur because a person's oral health is not ideal. Going beforehand may help prevent some mouth problems. Brush your teeth at least twice a day and after every meal with an extra-soft toothbrush. You should also gently brush your tongue and gums. Use a fluoride toothpaste. Your dentist may also recommend a mouth rinse. Follow the instructions provided by your dentist. Avoid mouth rinses that contain alcohol, which can dry the mouth. If you experience dry mouth as a side effect of cancer treatment, your dentist may recommend a saliva substitute. Follow the directions provided by the dentist. You can also keep your mouth moist by drinking lots of water, chewing sugarless gum, or sucking ice chips. Avoid foods that can irritate or hurt your mouth: Sharp or crunchy food (e.g., potato chips), spicy dishes, or high-acid food (e.g., citrus fruits and juices). Also avoid using toothpicks, which can cut your mouth. Avoid sugary foods, which can cause cavities. Call your dentist or doctor if your mouth hurts. Eating disorders can have a huge impact on a person's quality of life. Eating disorders include anorexia (characterized by extreme food restriction) and bulimia (characterized by overeating followed by vomiting or using laxatives to get rid of the food to prevent weight gain). Eating disorders, in addition to being a condition that requires medical attention, can also have an impact on oral health. How do eating disorders affect oral health? Eating disorders can mean the body is not getting adequate nutrition needed for good health. Without all the necessary vitamins and minerals, the gums and other tissue inside of the mouth may bleed easily. In bulimia, the frequent vomiting can affect teeth. Throwing up causes stomach acid to repeatedly wash over the teeth, causing erosion of the enamel, tooth sensitivity, thinning, and chipping. Eating disorders can also cause bad breath, mouth sores, tender mouth, dry mouth, cracked lips, sensitivity to hot or cold food and drinks, and changes in tooth colour, shape, and length. See your dentist regularly, who can help catch oral problems early. For most people, this may mean every 6 months, but for others, your dentist may have recommended that you visit more or less often. Follow the schedule your dentist suggests. Brush your teeth at least twice a day with a fluoride toothpaste. Floss your teeth every day, too. After throwing up, rinse your mouth with baking soda to help neutralize the stomach acid.